Once the wedding dates are fixed, before you make all the other arrangements the most important thing to do is prepare you wedding guest list. 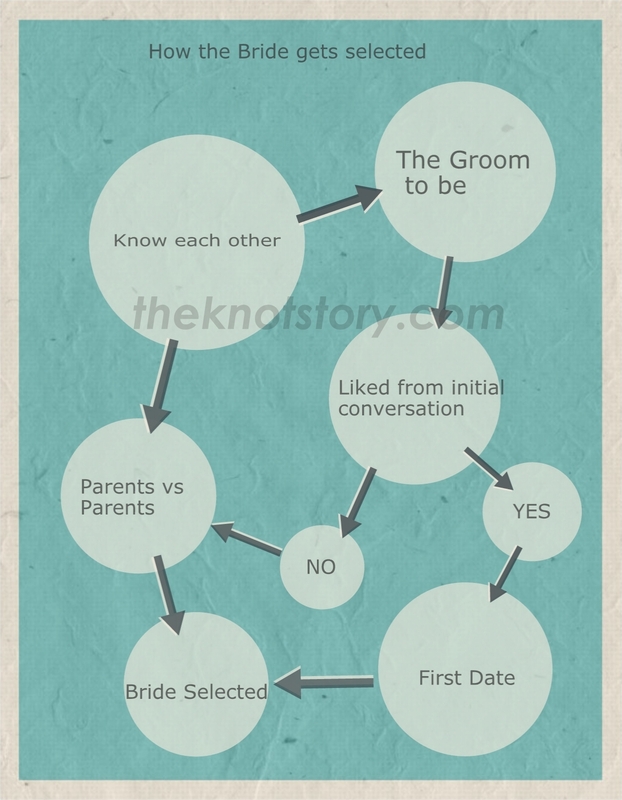 I remember my pre-wedding days, Parents had a separate list of their friends and relatives; same with my siblings. It took a lot of time and energy to coordinate with every one and prepare a proper guest list. In fact, I didn’t get a chance to search for applications, gadgets which could help me in managing my wedding invitations. Now, there are enough and more options, but we would like to give you some smart tips, So your learn from the mistakes I made and make use of your time effectively! All that Glitters is Gold – Wedding Jewelry!!! Indian weddings, now mostly addressed as Big Fat Indian weddings, the term derived from the glamour & glitz seen in Indian weddings. Once you enter a wedding venue, the first thing which comes in front of you is the decor, and then comes the wedding dresses and then the glitter. In any wedding the most expensive part of course is the wedding jewelry. Traditionally, Gold and silver is widely used in India as the wedding jewelry. Now a day’s diamond and platinum have conquered the bride’s heart as well as the jewelry market. Our modern North Indian brides prefer to wear jewels with latest designer work and expensive stones which match their bridal dress. As a person who got a chance to attend south and north Indian weddings, I have noticed that as you go towards south, gold is vastly used in wedding jewelry. The North Indian bride prefers designer diamond wedding ring and mangalsutras. While a South Indian bride still chooses their traditional Thali (mangalsutra) categorized upon their respective caste. They may purchase a set of diamond jewelry of latest fashion to be a part of the wedding jewelry, but the amount of gold they wear during the wedding will remain large as it depicts the status symbol of the family in the society. The gold wedding jewelry purchased is considered as an asset, but during the wedding this purchase needs a lot of planning. Both Bride and Groom have to Shell out money for this purchase including what parents intend to gift you. Bride’s family has to do the major purchase though. Indian jewelry is always known for its unique and artistic design and that’s the reason why it’s famous worldwide. Earlier we used to wear jewelry from head to toe, as time passed by the traditional style of wearing all these jewels has become rare and now jewelry is used mostly during the weddings. Believe it or not! The bride in south India wears up to 3 kg gold during the wedding :O :O . However this gold is considered as an asset gifted by her parents to make her future safe and secured. The Bengali brides wears theirs traditional jewelry like nath, paati haar, taaira, tikli, choker, kaan baala, chur etc. whereas the Tamil and Telugu brides wear Oddiyanam, maanamaalai, vanki, jhiki, mattals etc. The Malayali brides wear a lot of gold jewelry during the wedding. Some of them are kaasumaala, maangamaala, poothali, nagapadathali, Jhimki, thoda and lot more. 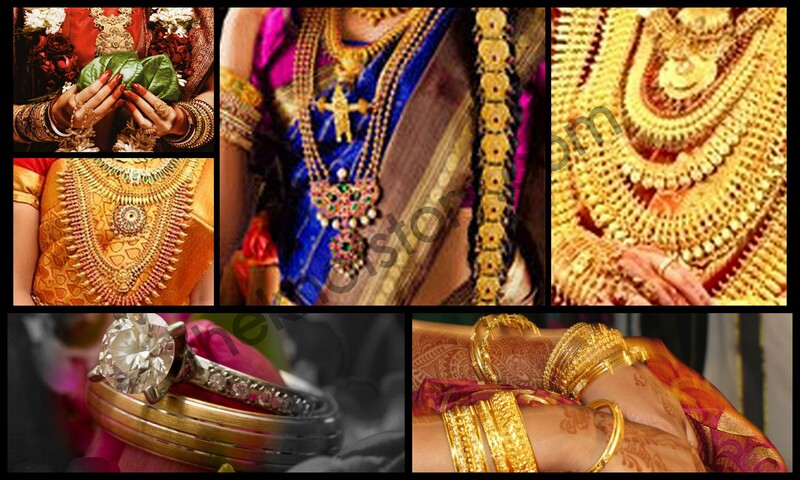 In the other parts of India gold jewels are comparatively less used during weddings. The gold is used along with diamond, platinum and other expensive stones. Theknotstory tip: Always purchase gold from an authorized jeweler and also check for BIS 916 Hallmark which is the symbol of purity. Some jewelers give an option where you can pay a certain amount and book jewels for that day’s price and later purchase it paying full amount. 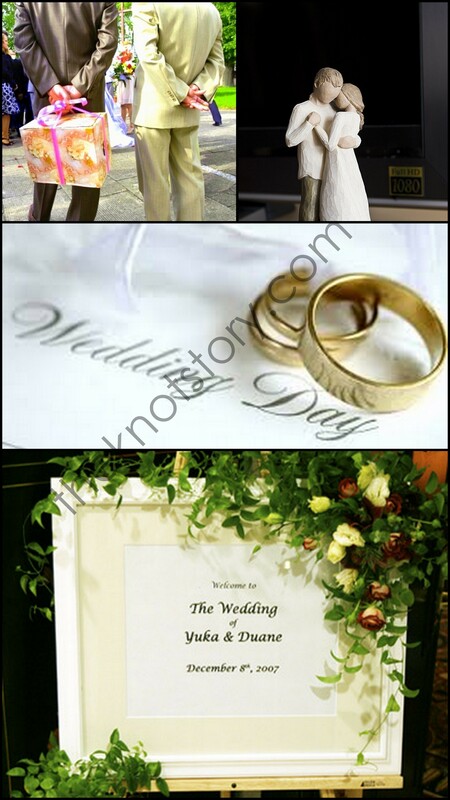 So be on a look out for the low price days and book you gold for the wedding jewelry! We told you a lot about the Lehengas and the Ghagras and the north Indian weddings. Time to travel to the south! 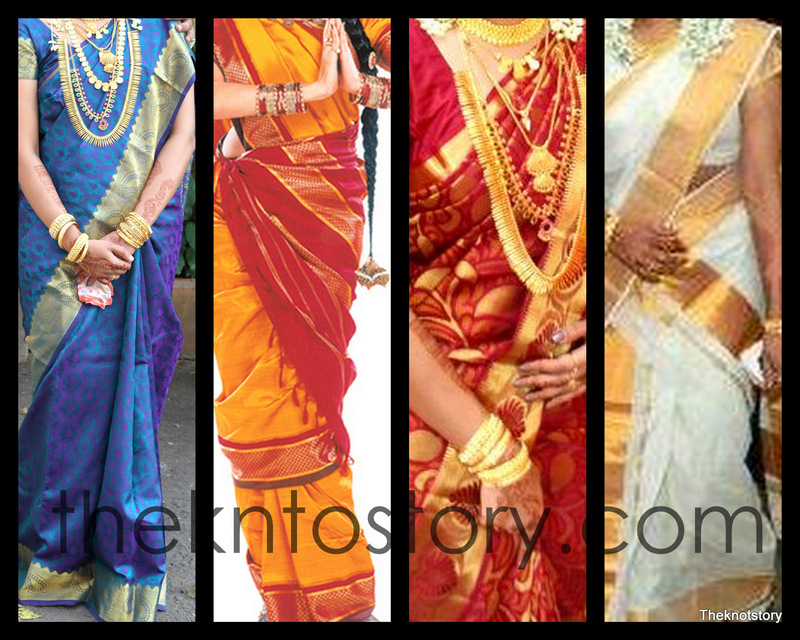 So here’s bringing information about what is worn by Bride in South Indian weddings. Let me tell you guys that in South India, weddings simplicity rules! The main focus in the South Indian wedding is on the wedding dress. Unlike other parts of India, where brides flaunt their lehengas in South Indian weddings you can see a large variety of Silk Sarees or “Pattu” Sarees. The silk comes from the cocoon of the silk worm and requires a great deal of handling and processing before it becomes your wedding dress. This makes it one of the most expensive fibers also. It is a tradition to wear silk sarees as your wedding dress in south Indian weddings. The price of these sarees varies from 1000 INR to lakhs depending on the quality and the amount of silk used in the saree. In any south Indian wedding, the bride needs to wear a number of sarees during various rituals apart from the main wedding saree. In some parts of south India like Karnataka and Maharashtra the bride wears a Nauvari silk saree along with green glass bangles with traditional gold during the wedding ceremony, whereas in Kerala ivory n gold combination is considered auspicious. In Tamil Nadu the saree is draped in a very different manner (Madirasi style). Whatever the color combination or style is, the quality of a bridal silk saree is excellent with sarees woven from the excellent quality of silk. Kanchipuram silks and Mysore silks two world-renowned names in this business. The North Indian culture & style have influenced the south Indian weddings too. Unlike earlier times, modern south Indian brides prefer designer wedding sarees, lehengas, cholis, salwars etc during their pre and post marriage functions like engagements, haldi , receptions etc. In fact some places they have introduced baraat (well with all entertainment)! Take a few threads from the wrap and weft of the saree and burn them. If a very tiny ash ball is left behind which smells like burnt hair, its pure silk.